James Milner’s penalty on the stroke of half time has given Liverpool some hope in their game against Paris Saint-Germain tonight. The Reds went in 2-1 down at the break, with goals from Juan Bernat and Neymar giving the home side a deserved advantage. This penalty decision wasn’t particularly clear-cut, but Sadio Mane was chopped down by Angel Di Maria just inside the box, even if he did appear to go down a little easily. 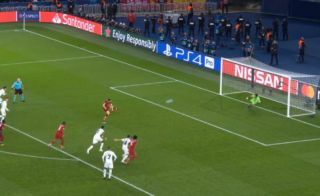 Milner made no mistake as he slotted away the penalty, showing himself to be Mr Reliable for Liverpool again in the Champions League. Still, Jurgen Klopp will want a big improvement from his players in the second half.